The NFL has a full-blown crisis on its hands, as players across the league have opted to disrespect our flag to make a juvenile political protest against our president and supposed racial injustice. Needless to say, football fans are reconsidering their support of the league, as viewership continues to drop as liberal politics takes over the sport and its many sponsors. Nobody wants to be lectured about their conservative views while trying to enjoy a mindless sporting event. With the NFL’s market share on the decline, other sports are looking to make up some ground on America’s most popular league. They say a wise man learns from others’ mistakes, which is exactly what Nascar is doing in light of all the National Anthem protests. As reported at the Daily Mail, unlike the weak-kneed NFL owners, their Nascar counterparts have come out and promised to fire any team member that tries to use the racetrack as a means to protest. 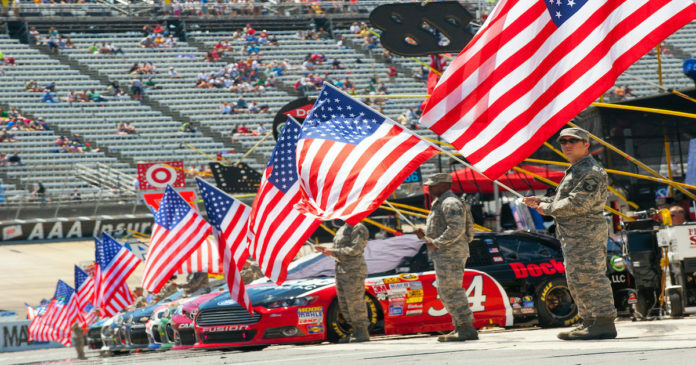 Nascar is well-known for its unabashed support for our troops and America, and at this weekend’s Nascar Cup Series race, not a single person was seen kneeling or trying to protest an issue. Many team owners and executives alike have said they want no part of the growing protest movement that’s taking over America’s sports. Richard Childress, the former owner of Dale Earnhardt’s infamous team, told the Associated Press: “It’ll get you a ride on a Greyhound bus.” Which is a far more principled and clear-cut stance than you’ll find in the other major sports, where organizations are terrified of incurring the wrath of whack-job leftists. The reason for the mass protest isn’t just the supposed racial injustice blacks suffer in America, but the president himself. It goes to show you just how deranged leftists are, that a simple comment from the president can send them off their collective rockers. All he did was point out the amusing fact that these athlete’s are making millions to play a game, while at the same time crying about racism and how blacks are mistreated. But when it comes to Trump, anything he says is controversial to the Left. They don’t care about making the nation great or improving the lives of citizens, only scoring political points. And if that means undermining the president and driving the nation in the ground, they’ll do it. All in the pursuit of power.